You would think that eventually your walk over familiar paths would offer up nothing but the familiar… but such is not the case… there is always something new for observant eyes. For me, yesterday, it was a shrub. No such luck (at first)… But there was a wonderful moss-covered log creating a bridge of sorts over the creek! While I was taking several dozen pictures of the moss, something caught my eye a little further upstream… A shrub covered with yellow-green blossoms… rather fragrant yellow-green blossoms! The bark is very tough and was reportedly used by Native Americans for a variety of things, including the weaving of baskets. I think I want some of these at Audubon in our Native Woodland Wildflower garden… Wouldn’t that be cool? After photographing the Leatherwood for quite some time, I turned to head back up the path and noticed the bank of the creek was covered with Spring Beauties. I swear they weren’t there when I first arrived. They must have bloomed while I was otherwise occupied, right? 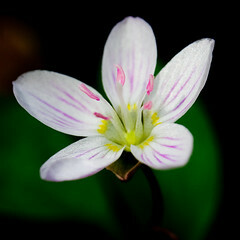 This entry was posted in spring, wildflowers. Bookmark the permalink. 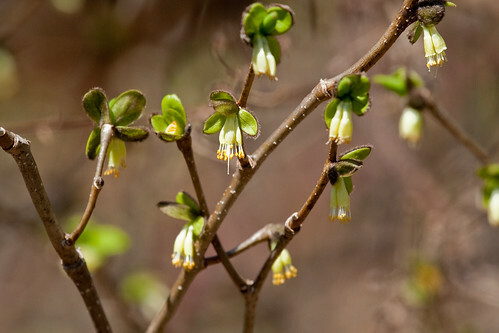 The Skidmore woods here in Saratoga is all abloom with Leatherwood this week, the first shrub to put forth its flowers. 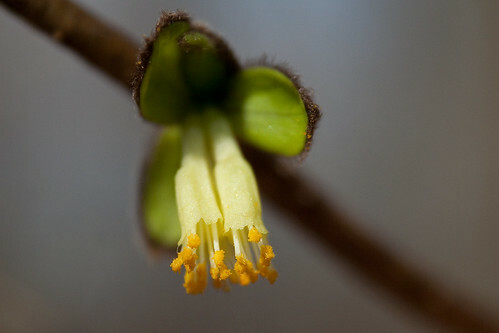 (Spicebush will follow shortly.) I noticed that some critters had browsed it over the winter and had difficulty ripping the twigs because of the toughness of the bark. The browsed twigs ended with shredded strips of dried bark. So SOMEBODY’s eating this shrub. 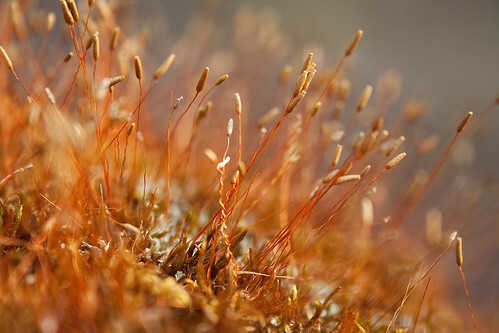 Love that moss image, although you could have stopped at my flower beds for that shot they are full of moss this spring? I first saw Dirca palustris in the Nebraska Statewide Arboretum and have since grown one in my backyard. It is a beautiful landscape shrub, needing only normal watering in extreme dry periods (grown in clay soil). It withstands wind and occasional temps into the low 100’s without problems. Fall color is a bright yellow. I do wish I had learned of it when I lived in New England to enjoy it in a natural setting.